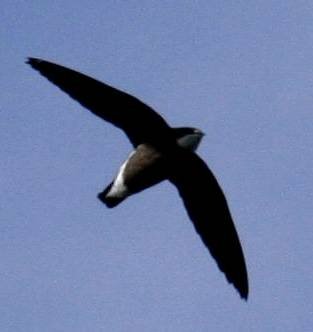 The White-throated Needletail is thought to be the fastest bird on the planet. It is not endangered, but it is rarely seen in Europe. However, an alert went out last week on the Rare Bird Alert Twitter feed, telling bird-watching enthusiasts that one had been spotted on the Outer Hebrides, an island chain off the west coast of Scotland. It was really beautiful when it was flying around, graceful and with such speed…To suddenly see it fly into a turbine and fall out the sky was terrible. I followed it and then watched as it flew into one of the blades of the wind turbine and vanished. My heart jumped into my mouth. We dashed over to see if it had been killed and sadly found its body on the ground. It was heartbreaking. Normally, I wouldn’t write about this kind of thing, but not too long ago, I wrote about a detailed study of how many birds and bats are killed by wind turbines each year. The numbers were startling, at least to me. The problem is that technical studies like that one rarely get much press, and they rarely have an impact on public policy. I wonder if this single example will make the public more aware of the dangers of wind turbines. Unfortunately, we don’t know whether or not this method of “saving the planet” will end up doing more harm than good! I have been somewhat distressed to learn that there are plans to put in a large group of wind turbines in Lake Erie just north of the Ottawa National Wildlife Refuge & Magee Marsh (between Toledo & Sandusky). These areas are KNOWN migratory bird habitats, especially for many different species of warblers, and are very active spring resting places. That being said, I also don’t know if these turbines are good/bad for the environment, nor am I an “animal rights” type person. As a farm wife, we raise animals for food and understand that God has given us dominion over these creatures. BUT I am also a bird watcher, and would hate to see beautiful warblers killed by wind turbines. Personally, I don’t know what the answer is here, but I do think it is rather stupid to put these turbines right in known migratory pathways. Certainly until we know more about wind turbines and their effects on birds, it is insane to put them in a known migratory path! I hope some reasonable people can keep that from happening. I agree that God has given us dominion over the animals, but that gives us responsibility to make sure we aren’t wantonly slaughtering them. Why not cage them like most household fans? Of course caging may decrease their efficiency, but at least you’d fix the bird issue and be able to get to more interesting questions about their efficiency, effects on local micro-climates, economic shifts causing labor to move to new areas the impact of their moving and building new housing, etc. Thanks for your comment, J. There are two problems with the cage. The first one is the one you mention. A cage will reduce the amount of electricity generated significantly. The second is just as difficult – the added weight would make the structure significantly more difficult to build. I think the better solution is a design specifically made for bird and bat safety. Replacing the ones that are already up, however, would be incredibly expensive.